Looking for a way to transfer Kik chat messages from Android to a new iPhone? Kik say no, we say yes. Backuptrans Android Kik to iPhone Transfer lets you migrate Kik chat history from Android to iPhone smoothly. All Kik Messages will be merged perfectly onto your iPhone. 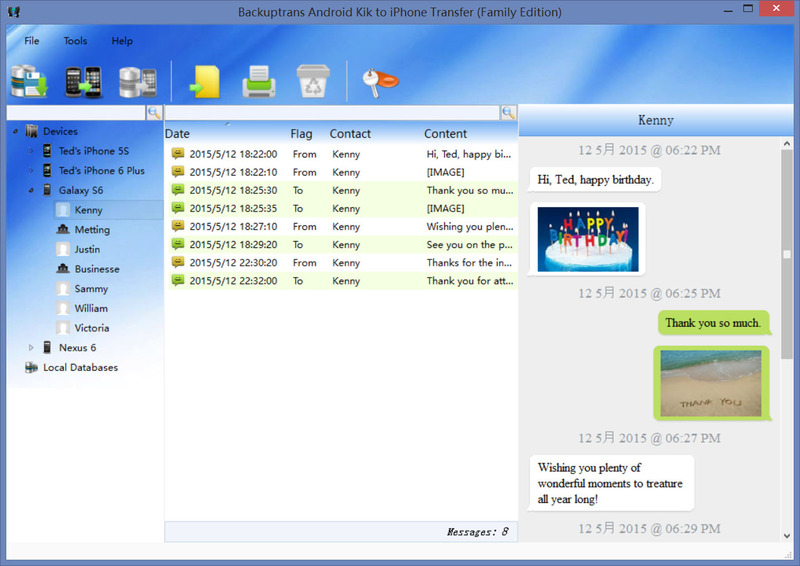 No other Android iPhone utility software can do this. 1 Transfer Kik Messages from Android to iPhone Directly. 2 Backup Kik Messages from Android to Computer. 3 Copy Kik Messages to iPhone from Computer. 4 Export Kik Messages from Android to document file(Txt, Csv, Doc, Html, PDF). 5 Print out Android Kik Messages in conversations on PC. 6 Support iPhone, Samsung, HTC, Motorola, Sony Ericsson, LG, Huawei and More.